We’ve been touching 46 degrees centigrade in our city over the past week. Burning up. It’s hard to forget that over 2000 people have died in this heat wave. It’s hard to forget the thousands who lost lives and property in our neighbouring country, Nepal. It’s easy to grumble about the heat. About the power outages. About how humid it is. About how we can’t go out during the day like we may want to, while there are millions who have no choice but to work in the sun…. Grumbling sometimes comes easy. Gratitude seems harder. But gratitude warms the heart like a fabulous summer day. I want to be grateful for every thing I enjoy in all seasons. But for now, I’ll focus on summer. My summer memories are pleasant ones – of holidays spent in Hyderabad at my grandparents’ home – crazy fun with cousins, mangoes, ice apples, ice-cream, laughter and the comfort of being part of a large family. I look back with gratitude. Our home is relatively cool and the power cuts much fewer than we anticipated. We have a choice to go out during the day. We don’t ‘have to’. Mangoes – sour green ones and lovely ripe yellow ones. I’ve not eaten to many, but have had some of the best thanks to the generosity of my brother’s friends who have their own orchards. Fresh, pungent mango pickle with cold curd rice for summer afternoons. Mmmm…can’t tell you how good that tastes. Our maid who is pleasant and hard-working and makes life so much easier for us and inspires me with her wisdom and life choices. A pleasant morning breakfast with some of the extended family for Mother’s day. The joy of preparing for and training a course in contemplative writing. Open participants, ready to explore their feelings and share them are always a joy. Writing my morning pages again and looking forward to them each day. Have meaningful conversations with friends and although we don’t talk or meet much, we’re connected because of our shared past and that means a lot. The unconditional love and support of my husband who cheers me on, pushes me, and helps me see parts of myself that I am unable to see. The revival of Write Tribe and the joy of creating there. The joy of intuitive painting and the thrill of learning something new. 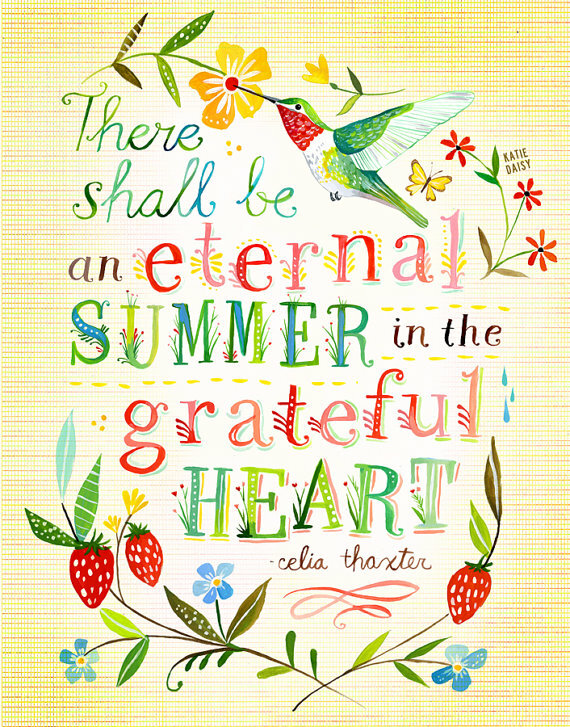 Summer continues right through the year when gratitude fills my heart! Earlier this month, I created a 21 Day Gratitude Challenge and posted it on the Everyday Gyaan Facebook page. I have now converted it into a slide show which you can view on Slide Share here. If you haven’t undertaken the challenge already, I invite you to start on the 1st of June. Thank you. Our Gratitude Circle post is a regular feature on the 4th Thursday of every month. Join Vidya Sury and me by writing a gratitude post and linking in to us and adding your linky to our Gratitude Circle Hop post. The linky is open for a whole month. Add this pretty badge to your post/ site and visit and read the other posts linked. It’s hard to fathom that so many people have died from a heatwave, and Nepal – well, I still can’t grapple that. My heart saddens for the beautiful people. Love your gratitude list – and I especially love the sound of intuitive painting! That’s a lovely Gratitude List and your post is inspirational as always..I come from North where it gets very very hot during Summers and I have similar memories of summer vacations – mangoes, ice creams, milk shakes, cold water, fun with cousins, reading story books and enjoying. feeling nostalgic! Another beautiful, inspirational post, Corinne, thanks! Loved the slide show, Corinne, and of course, your post. 🙂 As we’ve shared many times, being a believer in and a practitioner of gratitude always brings unmitigated joy to our hearts and get us straight in line with God’s will for us. It’s so easy to get caught up in complaining about things like the weather, isn’t it? Sometimes it seems as though we humans are never happy! But focusing on gratitude brings it all back into perspective. Thank you for sharing your lovely list. What a great attitude you have (along with those memories). On our end I am grateful for the rain, rain, rain. We dealt with drought a few years back and I don’t ever want to do that again. Everything is beautifully green, ponds overflowing (as is the pool), plenty for the cows to eat, much cooler weather than normal but it will warm up so I’ll enjoy the cool for now! I have been concentrating on the blessings in my life – as has Alpha Hubby so I did enjoy reading this post today!